What Bantam Breed Chicks Have Chipmunk Markings? Early spring brings the sound of peeping chicks to feed stores and backyard coops. Many chicks look like puffs of solid red, yellow, brown or black down, making striped chicks stand out from the crowd. Dark blazes play against a gray or buff background, making chicks from a few breeds look quite a bit like chipmunks. Striped like chipmunks, bantam brown leghorns are one of the most common bantam breeds. Full-sized leghorns produce most of the world's white eggs, and the bantam version is no exception, laying up to 300 eggs annually. A striped chick emerging from a blue, pink or green egg is known as an "Easter Egger," a crossbreed of an Araucana or Ameraucana with other breeds of chicken, such as the brown leghorn. 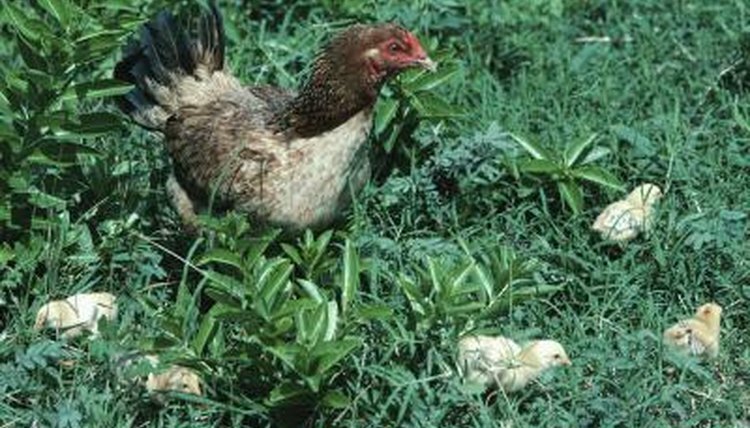 The chicken and his offspring come in both full-size and bantam varieties and are often sold as "Americaunas." Rhode Island red chicks exhibit a wide variety of down, ranging from solid colors to spots and stripes. If your bantam RIR chick is striped, chances are good it will grow up to be a hen. In research conducted by the Massachusetts Agricultural Experiment Station in 1940, observations showed that just over 80 percent of striped chicks in this breed turn out to be female. How Do I Tell What Kind of Chicken I Have? What Does a Male Magpie Duck Look Like? What Gender of Turkey Gobbles?